It is suddenly popular in this country to bash Kanye West, now that he’s publicly affirmed his support for President Donald Trump — and has even scored a lunch meeting with the president, which is scheduled for Thursday. On Tuesday’s “CNN Tonight,” hosted by Don Lemon, the topic was Kanye West as a representative of the black community — and in the panel’s opinion, the rapper and entertainer does not measure up. 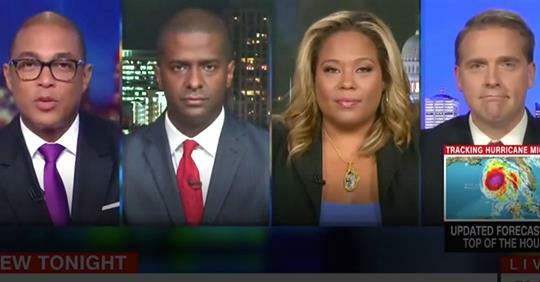 CNN commentator Bakari Sellers (shown above, second from left), host of the “Viewpoint with Bakeri” podcast, responded to the rapper’s scheduled meeting to discuss prison reform and job opportunities for ex-cons by basically calling West ignorant, as Biz Pac Review and others reported. “Kanye West is what happens when Negroes don’t read,” Sellers told CNN host Don Lemon (above, far left). Sellers talked about how West supposedly treats Trump, which is to “shower him with adulation,” before questioning his intelligence by saying several times that West doesn’t have the “depth” to talk about issues of importance to the black community. This distinguished CNN panel would likely find that Einstein , Hawking etc were brain dead morons if they endorsed DJT. I wonder when CNN and the other anti Trump media outlets are going to stop calling 50% of the voters in the USA idiots. It is amazing how Higher Purpose, SJW PC Types, always reach for Labels such as Low Information, Morons, Sexist, Racist, Uneducated, Morally Bankrupt, Greedy, and the Rest when criticizing Conservative Free Enterprise Supporters. Of course we all really know it is the Taylor Swift, Rosie O Donnell, McGowan, Carey a Canadian, and the rest that really understand Politics, yes now there is a group of thinkers. Lets see these nuts say Trump is an unhinged idiot, not fit to be POTUS, but he is a long time self made multi-billionaire. Kanye West is said b y them to also be unintelligent and mentally unstable but look at this, he’s a into the hundreds of millions, millionaire. It just shows how much the corporate media has disconnected itself from its audience and has gone off on some tangent that can only end in self destruction. Less than 10 years ago, it would have been considered an honour to be invited to the White House to meet the President of the United States. Now, according to the corporate media, it is something that classifies the attendee as “mentally ill”. It’s time to put the corporate media to rest. In bankruptcy. And we wonder why people are tuning out. I remember a time when one could disagree on politics ,have a mature discussion , leave learning a few things and nothing was personal. Now if you disagree you are labeled anything from deplorable to mentally ill. . Talk about a diservice to those who live with the stigma of any mental health issues. .
Let’s get back to fair rational reporting and commentary.. When I was a young lad and CNN was first on, I instantly had the hots for Bobbie Batista, and then for Lynne Russell. Oh those days. Nowadays, I get more useful info reading “The Buzzer” on a hydro bus.